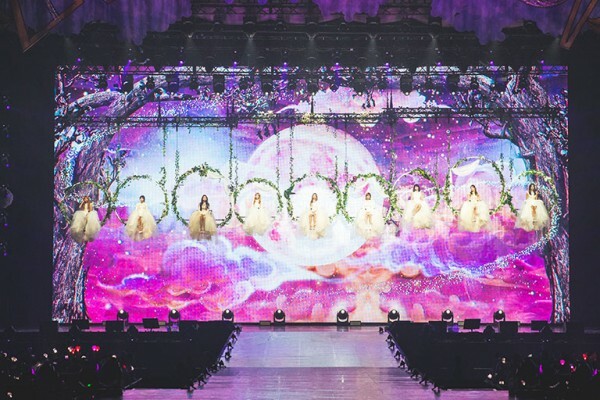 Returning to Singapore for the 2nd edition of Twiceland Zone 2: Fantasy Park In Singapore, Twice affirmed their status as one of Korea's leading girl group with an amazing concert performance filled with the catchiest songs and unforgettable stages to a roaring crowd of 8500 Onces. Even before the concert, fans begin queuing in the early morning at the Singapore Indoor Stadium in order to buy concert merchandises. The result? A sea of rainbow-colored lightsticks glittering around the entire arena as the fans gave their loudest cheers at the start of the concert. Kicking off the concert with 'You In My Heart', Twice performed popular singles 'Like Ooh Ahh' and 'Cheer Up' accompanied with synchronized fan chants that nearly brought the roof down. From the packed mosh pits to the terraces and balconies, Onces definitely made their support be heard over the music and Twice was visibly energized by their fans' support. Twice leader Jihyo told the fans that she is thankful and happy that they get to return to Singapore to meet their fans at a bigger concert venue and stage as compared to their first visit last year. Since it had been a year since they performed in Singapore, they have also diligently prepared upgraded stages for Onces. With that, Twice returned to the main stage that has now been decorated with snowflakes and like snow fairies, they sat down and performed 'Someone Like Me'. One of the highlights of the concert was when Twice members were given selfie sticks attached with video recording devices and they live recorded themselves and their fans while performing to 'Stuck' with their live recordings being displayed on the LED screens. They rounded the night off with 'One In A Million' and a ballad version of 'What Is Love' but there was still a last surprise in store as a specially prepared surprised video by the fans for Twice was played on the main screen. After the video ended, Jihyo thanked the fans for their continued love and support for Twice and she was especially thankful that the amount of Onces seem to have doubled from last year, promising that they will come back to Singapore again. Chaeyoung also commented that the energy level in the stadium today was exceptional and she was very touched that many fans have been waiting for them to come back to Singapore. Tzuyu also added in mandarin that she has received the birthday wishes well and she hope that Once will anticipate their next comeback!